1. The whole Vedanta philosophy is based on the Upanishad portion of the Vedas. The Chhandogya Upanishad contains several allegories, which have become the starting point of the philosophy. There is, for example, a dialogue in the Chhandogya Upanishad between a young student Shwetaketu and his father Uddalaka Aruni, in which the father tries to convince the son, that with all his theological learning, he knows nothing and then tries to lead him on to the highest knowledge, the Tatvmai or `thou art that'. The father said to him, "Shwetaketu, go to school, for there is none belonging to our race, darling, who not having studied, is, as it were, a Brahman by birth only. He began his apprenticeship with a teacher when he was 12 years of age. He returned home when he was 24, having then studied all the Vedas- conceited, considering him well- read and very stern. His father said, to him, " Shwetaketu, as you are so conceited, considering yourself so well read and so stern, my dear, have you asked for that instruction by which we hear what is not audible, by which we perceive what is not perceptible, by which we know what is unknowable." "What is that instruction, Sir?" he asked. The father replied,” My dear, as by one clod of clay all that is made a clay is known, the difference being only a name arising from speech, but the truth being that all is clay; and as, my dear, by one nugget of gold all the is made of gold is known, the difference being only a name arising from speech, but the truth being only a name arising from speech, but truth being that all is gold; and, as my dear, by one pair of nail scissors all that is made of iron is known, the difference being only a name arising from speech, but the truth being that all is iron. Thus, my dear, is that instruction." The son said, "Surely those venerable men (my teachers) did not know that. For if they had known it why should they not have told it me? Do you, Sir therefore, tell me that." The father said, "In the beginning, my dear, there was that only which, is, one only without a second. Others say, in the beginning there was that only which is not, one only without a second; and from that which is not, that which is was born. But how could it be thus, my dear? How could that which is be born of that which is not? No, my dear, only that which is, was in the beginning, one without a second. It thought, may I be many, may I grow forth. It sent forth fire. That fire thought, may I be many, May I grow forth. It sent forth water. Water thought, may I be many, may I grow forth. It sent forth. It sent forth fire. That fire thought, may I be many, may I grow forth. It sent forth water. Water thought, may I be many, may I grow forth. It sent forth earth (or food). Therefore whenever it rains anywhere, most food is then produced. From water alone is eatable food produced. As the bees, my son, make honey by collecting the juices of descant trees and reduce the juice into one form, and these juices have no discrimination, so that they might say, I am the juice of this tree or that tree, in the same manner, my son, all these creatures when they have become merged in the true (either in deep sleep or death) know not that they are merged in the true. Whatever these creatures are here, whether lion or a wolf or a boar or a worm or a midge or a gnat or a mosquito, that they become again and again. Now that which is the subtle essence, in it all that exists has its self. It is the true. It is the self, and thou, O Shwetaketu, art it." "Please, Sir, inform me still more", said the son. "Be it so, my child," the father replied. "These rivers, my son, run the eastern like the Ganges to the East, the western like the Indus to the West. They go from sea to sea, i.e., the clouds lift up the water from the sea to the sky and send it back as rain to sea. They become indeed seas. And as those rivers, when they are in the sea, do not know, I am this or that river, in the same manner, my son, all these creatures when they have come back from the true know not that they have come back from the true. Whatever these creatures are here, whether a lion or a mosquito, that they become again and again. That which is that subtle essence, in it all that exists has its self. It is the true. It is the self, and thou, O Shwetaketu, art it." "Please, Sir, inform me still more," said the son. "Be it so, my child," the father replied. " If some one were to strike at the root of this large tree here, it would bleed but live. If he were to strike at its stem, it would bleed but live. If he were to strike at its tip, it would bleed but live. Pervaded by the living self that tree stand s firm, drinking in its nourishment and rejoicing. But if life (the living self) leaves one of its branches, that branch withers, if it leaves the whole tree, the whole tree withers. In exactly the same manner, my son, know this. This body indeed withers and dies when the living self has left it; the living self never dies. That which is that subtle essence, in it all that exists has its self. It is the true. It is the self, and thou, O Shwetaketu, art it." "Please, Sir inform me still more," The son said. "Be it so, my child," the father said. Place this salt in water and then wait on me in the morning." the son did as was commanded. The father said to him, "Bring me the salt which you placed in the water last night," The son having looked for it found it not, for of course it was melted. The son having looked for it found it not, for of course it was melted. The father said, "Taste it from the surface of the water. How is it?" The son replied, " It is salt." "Taste it from the middle, How is it?" "It is salt" "Taste it from the bottom. How is it?" The son said, " It is salt." The father said, " Now leave the vessel and sit by my side." He did so. The father asked, "Where is the salt? Do you see it?" The son said, " I do not see it but it is in the water." The father said, " Here also in this body you do not perceive the true, my son, but there indeed it is. That which is the subtle essence, in it all that exists has its self. It is the true. It is the self, and thou, O Shwetaketu, art it." "Please, Sir, inform me more." "Be it so, my child. If a man is ill, his relatives assemble round him and ask- dost thou know me? Now as long as his speech is not merged in the mind, his mind in breath, his breath in heat, heat in the highest Godhead, he knows them. But when his speech is merged in his mind, his mind in breath, breath in heat, and heat in the highest Godhead, he knows them not. That which is the subtle essence, in it all that exists has its self. It is the true. It is the self, and thou, O Shwetaketu, art it." 2. I told you last time that the Vedanta philosophy is based on the Upanishads. The ritual of the Vedas was considered the Karmkand or the work portion, the Upanishads constituted what is known as Gyankand or the knowledge portion in so far as it propounds a certain theory of the world. I also told you that Mimamsa was a system of ritualism which gave a correct interpretation of the ritual of the Veda and the solutions of doubts and discrepancies in regard to Vedic texts caused by the discordant explanations of opposite schools. Just as the ritualistic portion of the Vedas became object of comment by Jaimini, the author of the Mimamsa so did Badarayana comment on or rather composed aphorisms based on the Upanishads. (a) Whatever is, is in reality one; there truly exists only one universal being called Brahma or Parmatman (the highest self). This being is of an absolutely homogeneous nature; it is pure being or, which comes to the same, pure intelligence or thought Chaetanya, gyan. Intelligence or thought is not to be predicated of Brahma as its attribute but constitutes its substance. Brahma is not thinking being, but thought itself. It is absolutely destitute of qualities; whatever qualities or attributes are conceivable can only be denied of it. But if nothing exists but one absolutely simple being, whence the appearance of the world by which we see ourselves surrounded and in which we ourselves exist as individual beings? The answer is that Brahma is associated with a certain power called Maya or Avidya. This power cannot be called 'being', for 'being' is only Brahma; nor can it be called' not-being' in the strict sense, for it at any rate produces the appearance of this world. It is in fact a principle of illusion, the non-definable cause owing to which there seems to exist a material world comprehending distinct individual existences. Being associated with this principle of illusion Brahma is enabled to project the appearance of the world, in the same way as a magician is enabled by his incomprehensible magical power to produce illusory appearances of animate and inanimate beings. Maya thus constitutes the Upadan (the material cause) of the world, or if we wish to call attention to the circumstance that Maya belongs to Brahma as Shakti, we may say that the material cause of the world is Brahma in so far as it is associated with Maya. In this latter quality Brahma is more properly called Ishwar (the Lord). Maya under the guidance of the Lord modifies itself by a progressive evolution into all the individual existences distinguished by special names and forms, of which the world consists; from it there spring in due succession the different material elements and the whole bodily apparatus belonging to sentient beings. In all those apparently individual forms of existence the one indivisible Brahma is present, but owing to the particular adjuncts into which ( ) has specialized itself it appears to be broken up-it is broken up, as it were- into a multiplicity of intellectual or sentient principles, the so called Jeev (individual or personal souls). What is real in each is only the universal Brahma itself, the whole aggregate of individualizing bodily organs and mental functions, which in our ordinary experience separate and distinguish one Jeev from another, is the offspring of Maya and as such unreal. The phenomenal world or world of ordinary experience Vyvehar thus consists of a number of individual souls engaged in specific cognition's, volition's and so on and of the external material objects with which those cognition's and volition's are concerned. Neither the specific cognition's nor their objects are real in the true sense of the world, for both are altogether due to Maya. But at the same time we have to reject the idealistic doctrine of certain Buddhist schools according to which nothing whatever truly exists but certain trains of cognition acts or ideas to which no external objects correspond for external things, although not real in the strict sense of the word, enjoy at any rate as much reality as the specific acts, whose objects they are. (b) The non- enlightened soul is unable to look through and beyond Maya, which like a veil hides from it its true nature. Instead of recognizing itself to be Brahman it blindly identifies itself with its adjuncts Upadhi - the fictitious off springs of Maya, and thus looks for its true self in the body, the sense-organs and the internal organ Manas, i.e., the organ of specific cognition. The soul, which in reality is pure intelligence, non-active, infinite, thus becomes limited in extent, as it were, limited in knowledge and power, an agent and enjoyer. Through its actions it burdens itself with merit and demerit, the consequences of which it has to bear or enjoy in series of future embodied existences, the Lord-as retributer and dispenser-allotting to each soul that form of embodiment to which it is entitled by its previous actions. At the end of each of the great world periods called Kelp, the Lord retracts the whole world, i.e. the whole material world is dissolved and merged into non-distinct Maya while the individual souls, free for the time from actual connection with Upadhi, lie in deep slumber as it were. But as the consequences of their former deeds are not yet exhausted they have again to enter an embodied existence as soon as the Lord sends forth a new material world, and the old round of birth, action, death begins anew to last to all eternity as it has lasted from all eternity. (c) The means of escaping from this endless Sansara, the way-out of which can never be found by the non-enlightened soul, are furnished by the Veda. The Karmkand indeed whose purport it is to enjoin certain actions cannot lead to final release, for even the most meritorious works necessarily lead to new forms of embodied existence. And in the Gyankand of the Veda also two different parts have to be distinguished, viz. firstly those chapters and passages which treat of Brahma in so far as it is related to the world and hence characterized by various attributes, i.e. of Ishwar or lower Brahma, and secondly, those texts which set forth the nature of the highest Brahma transcending all qualities and the fundamental identity of the individual soul with that highest Brahma. Devout meditation on Brahma as suggested by passages of the former kind does not directly lead to final emancipation; the pious worshipper passes on his death into the world of the lower Brahma only, where he continues to exist as a distinct individual soul although in the enjoyment of great power and knowledge-until at last he reaches the highest knowledge and through it final release. That student of the Veda, on the other hand, whose soul has been enlightened by the texts embodying the higher knowledge of Brahma, whom passages such as the great saying 'That art thou' have taught that there is no difference between his true self and the highest self, obtains at the moment of the death immediate final release, i.e. he withdraws altogether from the influence of Maya and asserts himself in his true nature which is nothing else but the absolute highest Brahma. This is the teaching of Shankara. 4. According to Ramanuja, on the other hand, the teaching of the Upanishads is a little different. (a) He says: There exists only one all-embracing being called Brahma or the highest self or the Lord. This being is not destitute of attributes but rather endowed with all imaginable auspicious qualities. It is not intelligence as Shankara maintains but intelligence is its chief attribute. The Lord is all- pervading, all-powerful, all knowing, all merciful; his nature is fundamentally antagonistic to all evil. He contains within himself whatever exists. While according to Shankara, the only reality is to be found in the nonqualified homogenous highest Brahma which can only be defined as pure being or pure thought, all plurality being a mere illusion, Brahma according to Ramanuja's view comprises within itself distinct elements of plurality which all of them lay claim to absolute reality of one and the same kind. Whatever is presented to us by ordinary experience, viz. matter in all its various modifications and the individual souls of different classes and degrees, are essential, real constituents of Brahma's nature. Matter and souls Achit and Chit constitute according to Ramanuja's terminology the body of the Lord, they stand to him in the same relation of entire dependence and subservience in which the matter forming an animal or vegetable body stands to its soul or animating principle. The Lord pervades and rules all things which exist- material or immaterial- as their Anteryamee the fundamental text for this special Ramanuja's tenet- which in the writing of the sect is quoted again and again- is the so called Anteryamee Brahman, which says that within all elements, all sense organs and lastly within all individual souls there abides an inward ruler whose body these elements, sense organs an individual souls constitute. Matter and souls as forming the body of the Lord are also called modes Prkar of him. They are to be looked upon as his effects, but they have enjoyed the kind of individual existence, which is theirs from all eternity and will never be entirely resolved in Brahma. They however exist in two different periodically alternating conditions. At some time they exist in a subtle state in which they do not possess those qualities by which they are ordinarily known, and there is then no distinction of individual name and form. Matter in that state is non-evolved Avyakt individual souls are not joined to material bodies and their intelligence is in a state of contraction Sankoch. This is the Prley State, which recurs at the end of each Kalpa, and Brahma is then said to be in its causal condition Karn.avastha. To that state all those Vedic passage refer which speak of the Brahma or self as being in the beginning one only without a second. Brahma then is indeed not absolutely one, for it contains within itself matter and soul in a germinal condition; but as in that condition they are so subtle as not to allow of individual distinctions being made, they are not counted as something second in addition to Brahma. When the Prley state comes to an end, creation takes place owing to an act of volition on the Lord's part The primary non-evolved matter then passes over into its other condition; it becomes gross and thus acquires all those sensible attributes, visibility, tangibility and so on, which are known from ordinary experience. At the same time the souls enter into connection with material bodies corresponding to the degree of merit or demerit acquired by them in previous forms of existence; their intelligence at the same time undergoes certain expansion Vikas. The Lord together with matter in its gross state and the expanded souls is Brahma in the condition of effect Karyavstha. Cause and effect are thus at the bottom the same; for he effect is nothing but the cause, which has undergone a certain change Parin.am. Hence the cause being known, the effect is known likewise. (b) Owing to the effects of their former actions the individual souls are implicated in the Sansara, the endless cycle of birth, action and death, final escape from which is to be obtained only through the study of the Gyankand of Veda. Compliance with the Karmkand does not lead outside the Sansara. But he who, assisted by the grace of the Lord, cognizes and meditates on him in the way prescribed by the Upanishads reaches at his death final emancipation, i.e. he passes through the different stages of the path of the Gods up to the world of Brahma and there enjoys an everlasting blissful existence from which there is no return into the sphere of transmigration. The characteristics of the released soul are similar to those of Brahma; it participates in all the latter's glorious qualities and powers, excepting only Brahma's power to emit, rule and retract the entire world. 5. The chief points in which the two systems agree on the one hand and diverge on the other are these: Both systems teach Advaet i.e. non-duality or monism. There exist not several fundamentally distinct principles, such as Prakriti and Purush of the Sankhya, but there exists only one all-embracing being. While, however, the Advaet taught by Shankara is a rigorous, absolute one, Ramanuja's doctrine has to be characterized as Vishishtadvaesh i.e. qualified non-duality, non-duality with a difference. According to Shankara, whatever is, is Brahma, and Brahma itself is absolutely homogeneous, so that all difference and plurality must be illusory. According to Ramanuja also, whatever is, is Brahma, but Brahma is not of homogeneous nature, but contains within itself elements of plurality, owing to which it truly manifests itself in a diversified world with its variety of material forms of existence and individual souls is not unreal Maya but a real part of Brahma's nature, the body investing the universal self. The Brahma of Shankara is in itself impersonal, a homogeneous mass of objectless thought, transcending all attributes; a personal God it becomes only through its association with the unreal principle of Maya, so that, strictly speaking, Shankara's personal God, his Ishwar, is himself something unreal. Ramanuja's Brahma, on the other hand, is essentially a personal God, the all-powerful and all wise ruler of a real world permeated and animated by his spirit. There is thus no room for the distinction between a Pram Nirguna. And Apram Saguna Brahma, between Brahma and Ishwar. Shankara's individual soul is Brahma in so far as [it is] limited by the unreal Upadhi due to Maya. The individual soul of Ramanuja, on the other hand, is really individual soul of Ramanuja, on the other hand, is really individual; it has indeed sprung from Brahma and is never outside Brahma, but nevertheless it enjoys a separate personal existence and will remain a personality for ever. The release from Sansara means according to Shankara the absolute merging of the individual soul in Brahma, due to the dismissal of the errouneous notion the soul is distinct from Brahma; according to Ramanuja it only means the soul's passing from the troubles of earthly life into a kind of paradise where it will remain for ever in undisturbed personal bliss. As Ramanuja does not distinguish a higher and lower Brahma the distinction of a higher and lower knowledge is likewise not valid for him; the teaching of the Upanishads is not two fold but essentially one, and leads the enlightened devotee to one result only. (b) Vedanta philosophy then rests on the fundamental conviction of the Vedantistss that the Soul and absolute Being or Brahma is one in their essence. In the old Upanishads this conviction rises slowly; but when once it was recognized that the Soul and Brahma were in their deepest essence one, the old mythological language of the Upanishads was given up; for instance the passage representing the soul as travelling on the road of the fathers Pitryan or the road of the Gods Devyan. We read in the Vedanta aphorisms that this approach to the throne of Brahma has its proper meaning so long only as Brahma is still considered personal and endowed with various qualities but that when the knowledge of the true, the absolute and unqualified Brahman, the Absolute Being, has once risen in the mind these mythological concepts have to vanish. " How would it be possible," Shankara says, " that he who is free from all attachment, unchangeable and unmoved, should approach another person, should move or go to another place? The highest oneness, if once truly conceived, excludes anything like an approach to a different object or to a distant place." (c) The Sanskrit language has the great advantage that it can express the difference between the qualified and the unqualified Brahma by a mere change of gender; Brahma being used as a masculine when it is meant for the qualified and Brahma as a neuter when it is meant for the unqualified Brahma, the Absolute Being. This is a great help and there is nothing corresponding to it in English. (d) We must remember also that the fundamental principle of the Vedanta philosophy was not 'Thou art He' but 'Thou art that' and that it was not 'thou will be' but 'thou art'. This 'thou art' expresses something, that is, that has been and always will be, not something that has still to be achieved, or is to follow, for instance, after death. Thus Shankara says: "If it is said that the Soul will go to Brahma, that means that it will in future attain, or rather, that it will be in future what, though unconsciously, it always has been, viz. Brahma. For when we speak of some one going to some one else, it cannot be one and the same who is distinguished as the subject and the object. Also, if we speak of worship, that can only be if the worshipper is different from the worshipped. By true knowledge the individual soul does not become Brahma but is Brahma as soon as it knows what it really is and always has been. Being and knowing are one here." (c) Here lies the characteristic difference between Yoga philosophy and Vedanta. In Yoga the human soul is represented as burning with love for God, as filled with a desire for union with or absorption in God. We find little of that in the Upanishads, and when such ideas occur they are argued away by the Vedanta philosophers. They always cling to the conviction that the Divine has never been really absent from the human soul, that it always is though covered by darkness or nescience, and that as soon as that darkness or that nescience is removed the soul is once more and in its own right what it always has been. It is- it does not become- Brahma. (f) Last time I gave you the dialogue from the Chhandogya Upanishad between a young student Shwetaketu and his father. In that dialogue we have only a popular and not yet systematized view of the Vedanta. There are several passages indeed, which seem to speak of the union and absorption of the soul rather than of its recovery of its true nature. Such passages are always explained away by the stricter Vedanta philosophers and they have no great difficulty in doing this. For there remains always the explanation that the qualified personal Brahma in the masculine gender is meant and not yet the highest Brahma, which is, free from all qualities. That modified personal Brahma exists for all practical purposes, till its unreality has been discovered through the discovery of the highest Brahma; and as in one sense the modified masculine Brahma is the highest Brahma as soon as we know it and shares all its true reality with the highest Brahma as soon as we know it, many things may in a less strict sense be predicated of Him, the modified Brahma, which in truth apply to it only, the highest Brahma. This amphibole runs through the whole of the Vedanta Sutras and a considerable portion of the sutras is taken up with the task of showing that when the qualified Brahma seems to be meant it is really the unqualified Brahma that ought to be understood. Again, there are ever so many passages in the Upanishads which seem to refer to the individual soul but which, if properly explained, must be considered as referring to the highest Atman that gives support and reality to the individual soul. This at least is the view taken by Shankara, whereas the fact is that there have been different stages in the development of the belief in the highest Brahma and in the highest Atman; and some passages in the Upanishads belong to earlier phases of Indian thought when Brahma was still conceived simply as the highest deity and true blessedness was supposed to consist in the gradual approach of the soul to the throne of God. (g) The fundamental principle of Vedanta philosophy that in reality there exists and there can exist nothing but Brahma, that Brahma is everything, the material as well as the efficient cause of the universe, is of course in contradiction with our ordinary experience. In Indian as any where else, man imagines at first that he in his individual bodily and spiritual character is something that all objects of the outer world also exist as objects. Idealistic philosophy swept this distinction with the Vedantistss. (h) The Vedanta philosopher however is not only confronted with this difficulty but he has to meet another difficulty peculiar to himself. The whole of the Veda is in his eyes infallible, yet that Veda enjoins the worship of many Gods and even in enjoining the worship Upasana of Brahma, the highest deity in his active masculine and personal character, it recognizes an objective deity different from the subject that is to offer worship and sacrifice to him. Hence the Vedanta philosopher has to tolerate many things. He tolerates the worship of an objective Brahma as a preparation for the knowledge of the subjective and objective or the Absolute Brahma, which is the highest object of his philosophy. He admits one Brahma endowed with quality, but high above the usual Gods of the Veda. This Brahma is reached by the pious on the path of the Gods; he can be worshipped and it is he who rewards the pious for their good works. Still, even he is in that character the result of Avidya (ignorance, nescience), of the same ignorance which prevents the soul of man, the Atman, from distinguishing itself from its encumbrances, the so-called Upadhis such as body, the organs of sense and their works. (i) This nescience can be removed by knowledge only and this knowledge is imparted by the Vedanta which shows that all our ordinary knowledge is simply the result of ignorance or nescience, is uncertain, deceitful and perishable or, as we should say, phenomenal, relative and conditioned. The true knowledge called Smyagdarshan or complete insight cannot be gained by sensuous perception Prtyaksh or by inference Anuman, nor can obedience to the law of the Veda produce more than temporary enlightenment or happiness. According to the orthodox Vedanta, Shruti alone or what is called revelation can impart that knowledge and remove that nescience which is innate in human nature. (j) Of the higher Brahma nothing can be predicated but that it is and that through our nescience it appears to be this or that. When a great Vedantistss was asked to describe Brahma, he was simply silent- that was his answer. But when it is said that Brahma is, that means at the same time that Brahma is not, that is to say, that Brahma is nothing of what is supposed to exist in our sensuous perceptions. There are two other qualities, which may safely be assigned to Brahma, namely, that it is intelligent and that it is blissful, or rather that it is intelligence and bliss. Intelligent seems the nearest approach to Sanskrit Chit and Chaetanya. Spiritual would not answer, because it would not express more than that it is not material. But Chit means that it is, that it perceives and knows, though as it can perceive itself only we may say that it is lighted up by its own light or knowledge, or, as it is sometimes expressed, that it is pure knowledge and pure light. We can best understand it when we consider what is negatived by it, namely, dullness, deafness, darkness and all that is material. In several passages a third quality is hinted at, namely blissfulness, but this again only seems another name for perfection and chiefly intended to exclude the idea of any possible suffering in Brahma. It is in the nature of this Brahma to be always subjective and hence it is said that it cannot be known in the same way as all other objects are known, but only as a knower knows that he knows and he is. (k) Still whatever is and whatever is known-two things which in the Vedanta and in all other idealistic systems of philosophy are identical-all is in the end Brahma. Though we do not know it, it is Brahma that is known to us when conceived as the author or creator of the world, an office, according to Hindu idea, quite unworthy of the Godhead in its true character. It is the same Brahma that is known to us in our own self-consciousness. Whatever we may seem to be or imagine ourselves to be for a time, we are in truth the eternal Brahma, the eternal self. With this conviction in the background, the Vedantistss retains his belief in what he calls the Lord, God, the creator and ruler of the world, but only as phenomenal or as adapted to the human understanding. He thinks that just as a man believes in his personal self so he is sure to believe in a personal God, and such personal God may even be worshipped. But we must remember that what is worshipped is only a person, or as the Brahmins call it a Prteek, an aspect of the true eternal essence as conceived by us in our inevitably human and limited knowledge. Thus the strictest observance of religion is insisted on while we are what we are. We are told that there is truth in the ordinary belief in God as the creator or cause of the world, but a relative truth only, relative to the human understanding, just as there is truth in the perception of our senses and in the belief in our personality, but relative truth only. His belief in the Veda would suffice to prevent the Vedantistss from a denial of the Gods or from what we call atheism. In deference to the Veda the Vedantistss has even to admit, if not exactly a creation, at least a repeated emanation of the world from Brahma and re-absorption of it into Brahma from Kelp to Kelp or from age to age. If we ask what led to a belief in the individual souls the answer we get is the Upadhi, the surroundings or the encumbrances, i.e. the body with the breath or life in it, the organs of sense and the mind. These together form the subtle body Sooksham Shreer and this Sooksham Shreer is supposed to survive while death can destroy the coarse body Sthool Shreer only. The individual soul is held by this subtle body and its fates are determined by acts which are continuing in their consequences and which persist in their effects for ever, or at least until true knowledge has arisen and put an end even to the subtle body and to all phantasms of nescience. (I) How the emanation of the world from Brahma is conceived in Vedanta philosophy is of small interest. It is almost purely mythological and indicates a very low knowledge of physical science. Brahma is not indeed represented any longer as a maker or a creator, as an architect or a potter. What we translate by creation Srishti means really no more than a letting out and corresponds closely with the theory of emanation. The Upanishads propose ever so many similes by which they wish to render the concept of creation or emanation more intelligible. One of the oldest similes applied to the production of the world from Brahma is that of the spider drawing forth, i.e. producing, the web of the world from itself. Another simile, which is meant to do away with what there is left of efficient- besides material-causality in the simile of the spider which after all sill the throwing out and drawing back of the threads of the world, is that of hair growing from the skull. Nor is the theory of what we call evolution wanting in the Upanishads. One of the most frequent similes used for this is the change of milk into curds. The curds are nothing but the milk only under a different form. It was soon found however that this simile violated the postulate that the One Being must not only be one but that, if perfect in itself, it must be unchangeable. 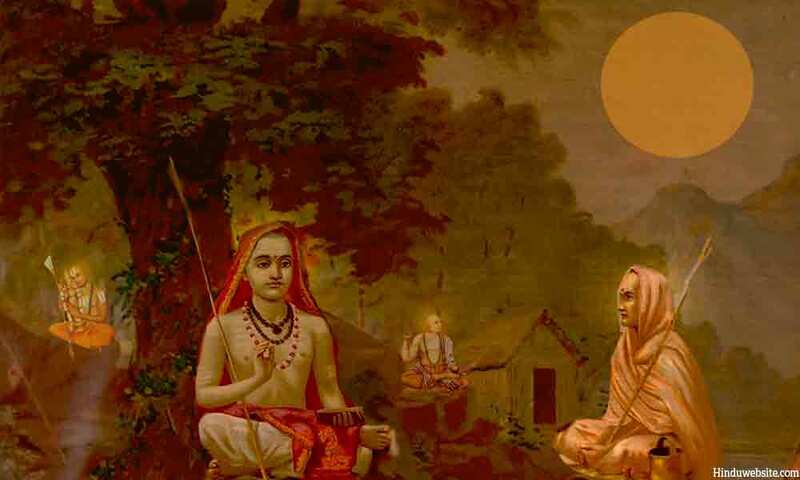 Shankara therefore offered a new theory. It is distinguished by the name of Vivart from the Parin.am or evolution theory, which is held by Ramanuja. Vivart of Shankara means turning away. It teaches that the Supreme Being remains always unchanged and that our believing that anything else can exist beside it arises from Avidya i.e. nescience. Most likely this Avidya or ignorance was first conceived as purely subjective, for it is illustrated by the ignorance of a man who mistakes a rope for a snake. In this case the rope remains all the time what it is, it is only our ignorance which frightens us and determines our actions. In the same way Brahma always remains the same, it is our ignorance only, which makes us see a phenomenal world and a phenomenal God. Another favorite simile is our mistaking mother-of-pearl for silver. The Vedantist says: We may take it for silver but it always remains mother-of-pearl. So we may speak of the snake and the rope, or of the silver and mother-of-pearl, as being one. And yet we do not mean that the rope has actually undergone a change or has turned into silver. After that the Vedantists argue that what the rope is to the snake the Supreme Being is to the world, They go on to explain that when they hold that the world is Brahma they do not mean that Brahma is actually transformed into the world, for Brahma cannot change and cannot be transformed. They mean that Brahma presents itself as the world or appears to be the world. The world's reality is not its own but Brahma's, yet Brahma is not the material cause of the world, as the spider is of the web, or the milk of the curds, or the sea of the foam, or the clay of the jar (which is made by the potter), but only the substratum, the illusory material cause. There would be no snake without the rope, there would be no world without the Brahma, and yet the rope does not become a snake nor does Brahma become the world. With the Vedantists the phenomenal and the nominal are essentially the same. The silver as we perceive and call it is the same as the mother-of-pearl; without the mother-of-pearl there would be no silver for us. We impart to mother-of-pearl the name and form of silver, and by the same process by which we create silver the whole world was created by worlds and forms. (m) Besides, the Vedanta philosophy has its own theory as to the creation of the whole world out of Brahma and Avidya. The purport of the philosophy however comes to this: All being is Brahma, nothing can be except Brahma, while all that exists is an illusory, not a real, modification of Brahma and is caused by name and form. When the true knowledge arises, everything becomes known as Brahma only. We may ask, whence the names and forms and whence the phantasmagoria of unreality. The Vedantists has but one answer, it is simply due to Avidya. There is another simile. Indian jugglers knew how to make people believe that they saw two or three jugglers while there was only one. The juggler himself remained one, knew himself to be one only-like Brahma; but to the spectators he appeared as many. But all these are similes only and with us there would remain the question whence this nescience. The Vedantists is satisfied with the conviction that for a time we are as a matter of fact nescient and what he cares for chiefly is to find out, not how that nescience arose but how it can be removed. (n) What is the mode of removing this ignorance? Bharati Tirtha, a famous Vedantist, says: "Neglecting the unreal creation consisting of mere name and form, one should meditate on the Brahma and should ever practice internal as well as external concentration. Internal concentration is of two kinds, Sviklp, and Nirviklp. The first is the meditation of (on?) the subjective Atma as the witness of the mental world-passions, desires etc. arising in the mind. The second is the fixing one's mind on the thought `I am Brahma', [Brahma] which is described in the Vedas as self-existent, eternal, all-consciousness and pleasure, self-illumined and unique in itself. That is Nirviklp in which, through the ecstasy of the pleasure consequent upon the knowledge of one's self, the sight as well as the world are both overlooked and the mind stands like the jet of a lamp burning in place protected from the slightest breeze. The separation in any external object of sight, of name and form from its original substratum Sat is Drishanuviddh external concentration. The meditation on the one, unique and Sachidanand Brahma as the only reality in the universe is Shabdanuvridh external concentration. The third nirvikalpa is, like the one described before, cessation of all thought, from the enjoyment of one eternal pleasure. One should devote one's time to these six kinds of Smadhi.3 The false identity of the material shell and the Universal Life being dissolved and the universal Atman being thoroughly realized, wherever the mind of the ascetic is directed there it naturally loses itself into one or other of these Samadhi. That limit of limits being seen, the knot of Ahamkar (egoism) is cut asunder, all doubts disappear, all actions cease to affect." This lecture is part of the lecture series dealing with the systems of Indian Philosophy delivered by V. R. Gandhi before American audience of the common people, while he was on his journey to attend the World Congress of Religions held for the first time in the United States of America in 1893 A.D. The text is reproduced with the understanding that it is in the public domain. Please verify the copyright laws of your country of residence before downloading the text.